It’s time to rejoice because Diwali is here. As you know festive season brings in with it a burst of joy and glee, let us all gear up to make our home sparkle with colourful lanterns and fairy lights. We all know that with hectic schedules, it has become tough to indulge in the Diwali preparations. Apart from this, the festival calls for an added responsibility of cleaning and refurbishing our home. So, if you are trying to get some unique ideas to decorate your new home say a luxury residence in New Town Kolkata then we are here to help you. Right from hanging strings of rice lights to creating handmade diyas, we will provide a variety of ways to jazz up your surroundings. Come let us discuss with you the best home decor ideas and help you lighten up your home this Diwali. To add a perfect touch to your home decor, bring in sequin cushions. 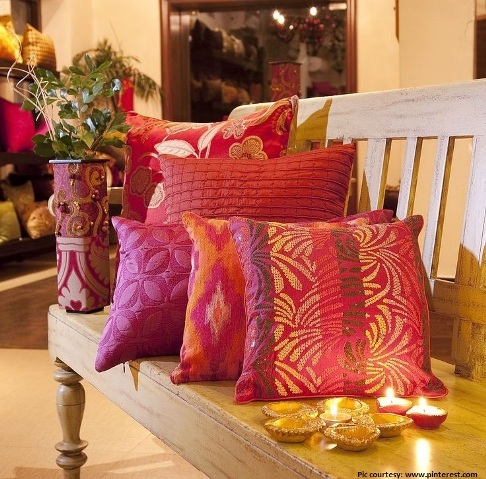 If you find your sitting area dull then these cushions will help in adding a pop of colour. Silver and Golden sequin cushions will do wonders because these shades go with nearly everything. In case there is a white background, you are free to play with shades of red, blue or orange as per your taste. How about placing colourful bowls with rosemary, lavender, different aromatic spices and other herbs? If you want to make your house smell divine for the guests then keep these aroma flavours around. Nowadays, as potpourri is readily available in different shops and can also be created at home with the help of YouTube, just go ahead with it. When Diwali is the festival of lights, do make sure you leave no dark space or corner in your house. If you feel that you are bored of the ordinary wall hangings in your house then just give it a twist with your creativity this Diwali. Why not create wall hangings and lamps out of mason jars? No wonder, this would be complimenting your Diwali decorations. We all know that it is not possible to change the wall paint every year. So, it is always advisable to change the curtains because it won’t take involve much hard work. This festive season take off all the boring curtains and replaces them with some bright red and orange shades. This festive season is incomplete without beautiful colours, so do not dare to miss out rangoli. Did you know that you can use recyclable materials to create a recycled, simple yet portable rangoli? This year do something different by decorating a rangoli with lace, ribbons, pearls, mirrors etc. So, by now you have understood what exactly you have to do. Of course, the festival of lights demands an extravagant and splendid decor in every possible way. This is not the time to relax and feel tired. This is that time of the year when you have to buck up and work to make the Diwali festival a memorable one.